Home / BB CHANNEL - C002242A6 / TWITTER @XoneBlog For More Update / Kirk Franklin Plans to Make 'God Famous' at SXSW. 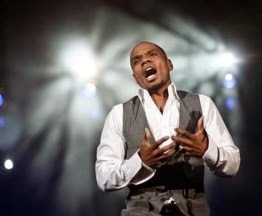 Kirk Franklin Plans to Make 'God Famous' at SXSW. Kirk Franklin is continuing his mission to make God famous by bringing his Fo Yo Soul Entertainment record label to the South by Southwest music festival. The South By Southwest (SXSW) film and music festival is entering its 28th year and will welcome gospel music sensation Franklin, 45. Franklin's popularity is hard to ignore with his own Sirius XM radio station, Kirk Franklin's Praise, television hosting gigs on The Game Show Network's "The American Bible Challenge" and BET's "Sunday Best." However, he took to Twitter to announce that his recording artists such as Tasha Page Lockhart and The Walls Group would join him at the festival in the form of a flyer on Twitter. "We're making God famous this year @SXSW pretty epic!," Franklin tweeted. Franklin and his gospel artists will be a part of the Kingdom Experience at the Promiseland Church in Austin, Texas, on March 20 for the SXSW experience. He previously spoke to The Christian Post about his goal to make God famous. In a previous interview he discussed how much fun it is to be involved with his various projects, but revealed a deeper reason for taking on each endeavor. "I'm always trying to find innovative ways to be able to keep God famous," Franklin told The Christian Post. "For all the properties I'm involved in, that's been my agenda. I think that sometimes we have compromised quality content for the fear of Christianity, and I think that they both can co-exist." The Walls Group, the quartet consisting of the Houston, Texas, based Walls siblings Darrel, 23, Rhea,19, Paco,18 and Ajah,16, have already experienced what it feels like to top the iTunes Christian/Gospel Charts and receive over one million views on Vevo with their first single "Perfect People." While the group will be joining Franklin at the upcoming festival in their home state, they previously spoke to The Christian Post about receiving counsel from the legendary musician. "One thing Kirk taught us is the fact that we are here to serve, not to be served," Darrel previously told CP. "And we carry that with us. We never want to forget who it's all about.